A recent survey from Watson Wyatt found that many workers struggle with health care terminology. I think Watson Wyatt might be surprised if they tried this same survey on managers – the results would probably be similar. Many otherwise smart employers we’ve met have magical thinking when it comes to clearly communicating workers comp information to employees. Some have a head-in-the-sand attitude that ignoring the issue will make it disappear. 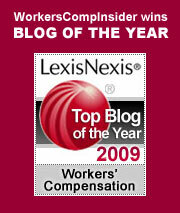 Others think that explaining workers comp in advance of an injury is akin to giving employees a cookbook for fraud. Actually, the opposite is true: the absence of information creates a vacuum, one that is all too frequently filled with misinformation and mistrust – and the very willing guidance of an attorney. I have some knowledge of being on the receiving end of poor communication from my first brush with workers comp a few decades ago when I tripped and fell down the stairs of a social service agency, my first full-time employer. I twisted my ankle badly but continued working until later in the day when the ankle swelled considerably. I told my boss I was going to have it checked out. No one suggested a doctor or gave me any information. At the emergency room, the intake person asked me if my injury happened at work or at home. When I said “work” I instantly became a persona non grata. The clerk frowned, turned to another person and said something like “she isn’t insured, she’s workman’s comp – what should I do with her?” The answer was “have her wait over there” and I sat “there” waiting for hours. While waiting, I worried. I had tried to let them know that I did indeed have insurance, but the clerk would have none of it. She said my insurance wouldn’t be valid because the injury happened at work and I would need to file a claim with the state workman’s comp board to see if they would pay for my injury or if I would have to pay for it myself. Great. I didn’t make very much money then – social service paid poorly and I lived one paycheck to the next. I was worried about how I would pay for things if the medical cost was high. When the doctor finally got to me, he greeted me with the information that he hated dealing with workman’s comp claims. Nevertheless, he wrapped my ankle, which turned out to be a sprain, and I was given a pair of crutches. The doctor suggested that since I was on workman’s comp (whatever that was, I still had no idea but it sounded increasingly awful) I should probably not go to work until I was better, a time frame that was vaguely suggested as anywhere from a few days to as much as a few weeks. My brother gave me a ride home. I told him about the insurance problem and he said if it was workman’s comp, I would probably have to get a lawyer. Great. More potential problems. The whole situation was baffling and uncomfortable because I had no idea what “workman’s comp” was. Plus, I usually had a great relationship with my boss, but he seemed angry at me, implying I had caused a problem for for the agency. So now I was doubly worried – I didn’t know who would pay for the doctor and I didn’t know if my boss would pay for my sick time since he seemed annoyed with me. Plus, I was uncomfortable that he suggested I should have lied. Hobbling on crutches, I returned to work the next work day, a Monday. The ankle healed, my boss made a big deal out of saying he paid for my injury, and things went on apace. For the next three years, in every budget meeting, I and the rest of the staff were reminded that the reason our budget was off kilter was because workers comp rates were outrageous ever since I had filed my workman’s comp claim. This was embarrassing for me. It wasn’t until many years later when I joined Lynch Ryan that I learned how ignorant my employer had been, how ignorant the provider was, and how lucky my organization was that I was a devoted employee and didn’t take my brother’s advice. My employer not only had encouraged me to fraud, he didn’t tell me anything about statutory benefits, which would have greatly eased my fears. The doctor also misinformed me, giving advice that would have had me needlessly malinger – and probably recover more slowly than I did. My situation wasn’t unusual. At Lynch Ryan, we have seen thousands and thousands of employees who meet with a similar vacuum of information and suffer similar anxieties after a work injury. Usually, financial worries and health restoration are the top two concerns of an injured worker and many employers do a poor job of providing reassurances that there is a safety net in place or explaining how the system works. Worried workers fill the information void with misinformation from a friend or relative. Today, they might find the information online. Go ahead, Google work injury and see where your employees are likely to get their information. Over the years, some large employers have grown more sophisticated in their workers’ comp communications to employees, but we still frequently see room for improvement. And the lion’s share of all employers – some 80-90% – are small employers with fewer than 25 employees. At many of these small workplaces, the situation for an injured worker today would not be far different from my experience a few decades ago, right down to the dated “workman’s comp” terminology. The court found that the Federal Motor Carrier Safety Administration had ignored the results of its own study, which reviewed more than 50,000 truck accidents from 1991 to 2002. Using the data, the study extrapolated a substantially higher risk of fatigue-related accidents in the extra hours of service allowed by the new rules. The court’s ruling does not take effect until September. In the meantime: data, shmata. Let’s haul our aching bodies into the cab and keep on truckin’! The current rules limit driving time to 11 hours and mandate a 10-hour rest time. ATA supports the current regulation, which promotes a regular work-rest cycle for truck drivers and a schedule that is closer to a 24-hour circadian rhythm. The 11th hour of driving time safely provides flexibility for trucking operations without increasing driver fatigue. The 34- hour restart gives drivers much greater flexibility to manage their time, relieving stress and allowing more time at home. I find the references to circadian rhythms and an enhanced home life a bit disingenuous. As my colleague Julie Ferguson reminded us in a recent post, truck drivers in general are notoriously unhealthy. They’re overweight, they smoke and they have trouble sleeping. Their health problems contribute substantially to the high rate of fatalities among drivers and the increased dangers to other drivers on the road. But heck, if they can’t sleep anyway, why not just let them keep on driving? Industry supporters of the loosened standards say they have made it faster and cheaper to move goods across the country. (There is a similar argument, of course, justifying the widespread use of undocumented workers in many labor-intensive, low-paying jobs.) The trucking industry says that the revised rules promoted safety (that sounds a bit dubious) and that shorter hours would force the industry to put more drivers with little experience behind the wheel. Is that really the choice: limit the hours of skilled drivers and suffer the consequences of inexperienced truckers – or increase the hours of skilled drivers and risk their making fatigue-fueled mistakes? Allow flexibility and personal choice, or set strict safety limits and enforce them? The freedom versus regulation arguments raise some interesting issues about our collective ability to manage risk. Is it worth the savings in dollars and time to over-extend truckers, especially in light of the compromised personal health that seems to accompany their choice of occupation? How do truckers (as opposed to their associations) feel about the regulations? I know how I feel. When I’m driving 70 miles per hour down an interstate, sandwiched between two rigs, I’m just hoping the other guys are sipping strong java and are tenaciously awake. Cavalcade – Catching up with news after being on vacation for a week, I find a good place to start is with last week’s Cavalcade of Risk, ably hosted by Richard Eskow of The Sentinel Effect. NIOSH research programs saved – David Michaels of The Pump Handle reports that with the defeat of The Barton Amendment, National Institute for Occupational Safety and Health programs have been saved. The bill would have cut more than 20% of the NIOSH budget and would have effectively eliminated the National Occupational Research Agenda. TRIA – Mark Hofmann of Business Insurance reports that the markup of the TRIA extension bill is expected this week. TRIA – a federal terrorism backstop due to expire Dec 31 – would extend for 10 years. MN groups sue AIG – Roberto Ceniceros of Business Insurance reports that Minnesota workers comp groups are suing AIG seeking $100 million in damages. The Minnesota Workers’ Compensation Reinsurance Assn. and the Minnesota Workers’ Compensation Insurers Assn. state that the $1.2 million that was earmarked for Minnesota in the settlement AIG reached with Eliot Spitzer for AIG’s alleged underreporting of premiums over 22 years is insufficient. Ceniceros notes that they are not they only entity filing suit – the National Workers Compensation Reinsurance Pool, representing about 600 insurers, also filed suit in May. Kudos – congratulations to Michael W. Fox of Jottings By An Employer’s Lawyer for his 5-year blogiversary – that’s a lot of blogging. Michael’s blog has long been one of our favorites – drop on by and see why. Wash any skin or clothing that comes in contact with gasoline thoroughly with soap. Avoid inhaling gasoline fumes by keeping all gas in approved sealable safety containers. Know initial symptoms of carbon monoxide poisoning, such as headache, fatigue, dizziness, drowsiness, nausea, and tightness across the chest. Do not use gasoline for any purpose other than fueling a motor. OSHA’s Gasoline Safety and Health Topics outlines standards for working safely with gasoline, including healthful exposure limits for employees. Also, to prevent carbon monoxide poisoning, see OSHA’s Carbon Monoxide Fact Sheet (PDF). Back in June we blogged the interesting case of Tony Boyle, who was awarded over $600,000 for wrongful termination after his employer, Weyerhauser, put him in a modified duty job that aggravated his work-related condition. I half expected to hear from the employer, defending their modified duty program. Instead, I am on notice from Mr. Boyle’s attorney that we have defamed his client. The point of contention was my conjecture (and it was a conjecture), that Boyle had been prescribed narcotic pain medication for his serious lower back injury (two herniated discs). After all, such drugs are the most frequently prescribed medications in the workers comp system (see prior blog here.) Attorney Richard Yaskin asserts that there is no evidence for the claim that Boyle “failed a company drug test.” He further asserts that Boyle was taking anti-inflammatories and muscle relaxers. So here’s where my reading of the articles led me astray: both articles refer to violation of the company substance abuse policy. McCarthy referred to painkillers (which frequently involve narcotics). I was wrong to assume that the violation involved prescribed narcotics and also mistakenly assumed that the violation involved a failed drug test. Indeed, the situation is even more bizarre than I originally had thought: Boyle was fired for operating equipment while taking anti-inflammatories and muscle relaxers, both necessitated by his work-related injury. Indeed, Mr. Boyle’s prescribed medications, Soma (Carisoprodol) and Celebrex, are not “narcotics.” Further, Mr. Boyle never failed a drug test in connection with his Weyerhauser employment. LynchRyan regrets any misunderstanding caused by publication of the original Weblog. Our sympathies in this situation clearly remain with Mr. Boyle. We had no intention of defaming him. In fact, given the severity of his injury, a short-term prescription for a narcotic medication would have been medically appropriate. Good for him that he worked through the pain and the injury with non-narcotics, and good for him that he is back to productive employment. And thanks to Attorney Yaskin for helping to clarify the situation. The Federal Motor Carrier Safety Administration (FMCSA) is increasingly concerned about the health and wellness of the nation’s trucker drivers – particularly those who drive large trucks. Today, health conditions like severe high blood pressure or severe heart conditions can be a bar to obtaining commercial driving licenses. FMCSA is now considering tightening its rules to encompass other health conditions, such as diabetes and high blood pressure. It’s no surprise that regulators would be looking at this issue. Both on the job and off, truck-related crashes take a high toll. In 2005, 5,212 people were killed in crashes involving large trucks, more than 12% of all traffic fatalities. Of these, 78 percent were occupants of another vehicle, 15 percent were large truck occupants, and 9 percent were non-occupants. The annual death toll from truck-related crashes is the equivalent of 52 major airline crashes every year, one crash every week resulting in 95 deaths. (Source: Truck Safety Coalition). According to the Large Truck Crash Causation Study 2006 report, which analyzed multi-year data of a large number of crashes involving trucks to determine cause, 88% of the critical reasons for accidents were assigned to drivers as opposed to vehicle failure, environment or other reasons. Critical reasons for driver-related crashes were further analyzed, and 15.6% fell into the category of “non-performance” issues – such as the driver being asleep, disabled by heart attack or seizure, or other disabled by some other physical impairment. Many employers are taking health issues seriously. Fredrix’ article explores ways that some employers are implementing a variety of work-based wellness initiatives aimed at improving health, such as paying for screenings for sleep apnea, high blood pressure and cholesterol and offering weight loss and nutrition programs. Such programs can have a very favorable cost-benefit ratio, such as the drop in workers compensation claims and the 75-80% reduction in lost work days experienced by Con-way Freight of Ann Arbor, Mich., after implementing trial wellness programs. Other experts point to a $3.14 return for every $1.00 invested in wellness programs. Today is Health Wonk Review day, so grab a coffee and click on over to Colorado Health Insurance Insider where host Jay Norris has amassed a great compilation of links. Unsurprisingly, Michael Moore’s Sicko is the focus of the lion’s share of today’s posts; that, and the ongoing debate about the best approach to fix the health care system. Even if you live in Florida or New York, don’t let the “Colorado” in the title dissuade you from taking a closer look at the host blog. Jay Norris and his wife Louise are savvy health insurance consultants. Their blog is filled with thoughtful and useful information, and it’s fun to read, too! WTC workers get a break – The workers’ compensation registration deadline has been extended by a year for recovery workers who were involved in the World Trade Center cleanup. Rupal Parekh of Business Insurance reports that WTC workers and volunteers will now have until August 19, 2008 to submit a registration. Registration extends the time line in which an injured worker or volunteer can file a claim. This is good news since recovery-related illnesses are still surfacing. Retaliation is a no-no, part 2 – We recently cited a huge judgement for wrongful termination in a news roundup. This week, courtesy of Roberto Ceniceros of Business Insurance, we note that in Kimberlee Trosper vs. Bag ‘N Save the Nebraska Supreme Court recently extended the state’s prohibition against retaliatory firing of workers compensation claimants to include retaliatory demotions. For more on this case, see the court’s ruling (PDF). The health care debate – Joe Paduda at Managed Care Matters is sparking some heated discussions in his role as myth buster in a recent series of posts about universal health care coverage. In the first post, he lists the common arguments against universal coverage. In two follow-on posts, he examines a few of these objections: we can’t afford it and people are uninsured because they choose not to buy insurance. We look forward to following the rest of the series. New blog discovery – We are happy to add Hazards Recognized to our sidebar blogroll. This occupational safety and prevention blog is a collaborative effort by Jason Heilpern, Corporate Safety Director of Healey Railroad, Barton Jones, president of EduSafe and Tom Lash, a Workplace Safety Professional at Insource Safety. It’s great to have some hands-on safety experts adding their voices to the blogosphere. One recent post of note: Honesty in Safety discusses the fact that most companies hiring contractors don’t check up on safety data submitted in the bid process – and many bidders lie on their forms to gain a competitive edge. NY WC ruling re immigrant workers – Peter Rousmaniere at Working Immigrants discusses Ramroop v. Flexo-Craft Printing Inc., 501026, 06/21/2007, a recent New York appellate court ruling that limits workers compensation protections for illegal workers. Peter notes that this contributes to a bifurcation of the nation’s worker protections into two systems – one for legal, the other for illegal workers – a slope we view as slippery. The Family and Medical Leave Act has been with us since 1993. In 2005 it covered about 76 million workers, with as many as 13 million making use of benefits under the act. Limited to employers with 50 or more employees, and to employees with at least one year of service, the act provides unpaid leave for birth, adoption and serious health conditions of the employee or an immediate family member. Employers essentially had to hold the job open for three months and continue to pay the employer portion of health insurance. If employees were absent for more than three months, the employer could move ahead with termination (provided, of course, they followed their own personnel procedures). The U.S. Department of Labor recently issued a detailed analysis of FMLA (the executive summary can be found here). The Department finds that, in general, the law is working as it was designed to work. As with any human attempt to engineer the working world, there have been unintended consequences and quite a bit of ambiguity. Indeed, in this detailed report, DOL seems to be establishing an agenda for future legislative and regulatory adjustments. One of the most controversial aspects of the law was the requirement that employers explicitly designate exactly when an employee was using the alloted three months of annual FMLA eligibility. The regulations stipulated that the designation could not be retroactive. In our workers compensation consulting, we frequently found that employers had failed to designate time lost due to workplace injury as “FMLA Leave.” Even if an employee had been out for three or four months, failure to make a designation at the time of the injury meant that three additional months of eligibility had to be tacked onto the time already lost. This was a painful lesson in reading the fine print in federal regulations. – What are an employee’s responsibilities under FMLA? – What workplace rules may an employer actually enforce? – How does FMLA interact with the ADA? Interesting questions, for sure. Given Washington’s hyper-political atmosphere, it will be fascinating to see how hard DOL pushes for legislative adjustments to the original act – especially with a Democratic controlled Congress. As the administration seeks to help employers by softening some of FMLA’s hard edges, there will be a countervailing pressure from the left to make the act even edgier: there is talk of dropping the threshold of covered employers from 50 employees down to 25 and requiring that employees be paid while on eligible leave. In case you haven’t noticed, we live in interesting times. We read in the Sydney (Australia) Morning Herald that workers comp benefits have been reduced for government workers. COMMONWEALTH public servants are no longer entitled to claim damages for accidents on the way to work or during lunch breaks. In addition, participation in the public service lunchtime football league is no longer covered. Claims for stress have also been severely curtailed under strict new guidelines on what constitutes mental injury. Public servants will no longer be able to claim damages for stress after disciplinary action, reprimand from a superior or a bad performance appraisal. The unions are not happy about the reduction in benefits (but then, why would any union endorse a loss of benefits?). Responding to the elimination of coverage for lunchtime soccer players, union head Stephen Jones comments that it is “counterproductive” to discourage public servants from keeping fit. Insurance actuaries would respond, naturally, that the risks inherent in soccer are not contemplated in the rates for government office workers. If stateside rates can provide a point of comparison, most office workers would fall under rates well below $1.00 per hundred of payroll, while soccer players would likely be around $30.00 per hundred. The issue here is not discouraging fitness, but separating high risk fitness activities from work. Previously, public servants could claim for stress if a reprimand or disciplinary procedure exacerbated an existing mental health condition. Now, a successful claimant must prove that stress or mental injury was caused by unjust behaviour. That’s an interesting and rather odd metaphor – comparing a reduction in benefits to breaking a plate glass window and snatching something valuable. I believe he is saying that it’s unfair to reduce the standard without increasing management accountability – which would have been a point well taken. Mental health groups in Australia have also opposed the changes. The national depression initiative beyondblue stated that the changes would “make it more difficult for individuals with a psychological illness/injury to make a successful claim for workers’ compensation”. This is undoubtedly true. The real question, of course, is finding an appropriate level of accountability for employers. If you have to pay workers comp for routine personnel actions, your costs are going to spiral out of control. From the Insider’s perspective, it appears that our colleagues down under are simply trying to bring their comp coverage into the 21st century. The pendulum has swung away from injured workers. In the USA, most state laws long ago eliminated coverage for routine commutes to and from work and during recreational activities, unless the latter were sponsored by the employer. As for stress claims, we now look for work to be the “predominant cause” of the stress. We’ve come a long way from the California gold standard that awarded benefits if 10 per cent of the stress was work related. Now that was a standard only a claimant attorney could love! NOTE TO READERS: For the next few weeks, the Insider will publish on a reduced summer schedule. We are planning to enjoy a little time off and recommend that you do likewise. Posted in Compensability | Comments Off on Feeling Down Down Under?